Ferrous metals, such as iron and steel, are well known for their corrosion in the presence of moisture. Less well known is the fact that glass corrodes and cracks at a rate which varies according to the moisture on its surface. Pure crystals, such as sodium iodide and lithium fluoride can also corrode, forming oxides and hydroxides in proportion to the moist air. Nonferrous metals such as copper are more sensitive to corrosion than plates of ferrous metals. In corrosion prevention applications, the controlled space is maintained at a specific relative humidity and temperature so that the products or material in the controlled space cannot absorb moisture from the surrounding atmosphere. Thus the products are also protected from corrosion. 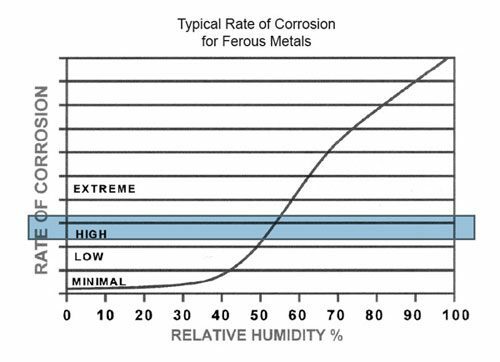 As a general rule, rust and other oxidizing type corrosion reactions will not occur if the relative humidity in the area is maintained at or below 40%RH Materials or product residing in this atmosphere need not be coated with oil or other surface protection, and can thus be kept in ready-to-use condition. Some of the corrosion prevention applications do not have coincidental temperature control. 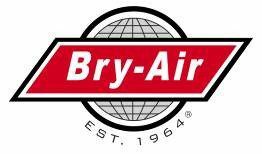 Humidity control is maintained to achieve protection of the area or products in the area, as this constitutes a much more economical method than air conditioning. An example of this is a waste pumping station or sewage plant, where the primary humidity control problem is the maintenance of a dew point within the space which is lower than the temperature of the liquid that is being circulated or stored there. In this way, condensation of moisture on the outside of pumps and piping is eliminated, thus significantly reducing the cost of painting and component cost due to corrosion. The world’s economies are beginning to depend more and more on light equipment such as computers, high energy batteries and sophisticated telecommunication cabling. While these are less subject to gross rusting, they are very sensitive to microscopic – level corrosion. The fact that these circuits consist of very little material to begin with, means that small amounts of corrosion create disproportionately larger problems. Circuits utilizing electrical contacts made of copper alloys are more susceptible to corrosion. 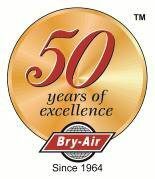 In the past 40 years, Bry-Air, Inc. Desiccant Dehumidifiers have saved our customers millions of dollars each year by preventing corrosion on both a gross and microscopic basis.